Consider two scenes from the waning months of the Obama administration: One took place on September 30, 2016, the day that U.S. President Barack Obama delivered a eulogy at the funeral of Simon Peres in Jerusalem. The second occurred in New York at a meeting of the U.N. Security Council on December 23, 2016, when resolution 2334 passed only because the U.S. decided not to exercise its veto. Both have separately been written about extensively. It is the juxtaposition of these two events that underlines an appalling inconsistency in the U.S. position on Jerusalem: Israel is treated by the U.S. with denial, while the Palestinians received, via the Security Council, a totally unwarranted gift that breaks with a 68-year-old U.S. policy. In 1995, Congress passed The Jerusalem Embassy Act requiring that the U.S. embassy be moved to Jerusalem. However, it gave the president an option to waive implementation every six months, and Presidents Clinton, Bush, and Obama each repeatedly exercised that waiver to defer the move. In justifying the deferral, the U.S. has taken the line that an action such as moving the embassy could prejudice future negotiations on the final status of the city. Another manifestation of the same U.S. policy concerns the passports of American citizens born in the Western part of Jerusalem. The passports are issued with “Jerusalem” as the birthplace, not “Jerusalem, Israel.” A case that sought to overturn this policy ultimately went to the U.S. Supreme Court and resulted in a 2015 decision supporting the administration’s position. On December 23, 2016 the U.N. Security Council met to consider a resolution ostensibly about Israeli settlements, a subject of exaggerated importance to the Obama administration since its early months in office, and one that had generated years of often hostile White House and State Department criticism of Israel. There had been much speculation for months that the Obama administration might not veto a Security Council resolution against Israel during the two and a half months between the November 8 election and the January 20 inauguration of a new president. And, indeed that is what happened on December 23. But, the resolution in question was not just critical of Israeli settlements; rather, it branded every settlement as being “without legal validity.” More than that, it contained language, in keeping with Palestinian demands, that referred to “Palestinian territory occupied since 1967, including East Jerusalem.” East Jerusalem contains the Old City (including the Jewish Quarter, the Temple Mount, and the Western Wall,) and the new neighborhoods built since the 1970s that are an inseparable part of the urban Jerusalem reality. The language defining East Jerusalem as “Palestinian territory” was totally at variance with 68 years of U.S. policy on Jerusalem. For the Palestinians, the wording on East Jerusalem in 2334 complements the scandalous UNESCO resolution of October, 2016, denying a Jewish connection to the Temple Mount. The U.S. opposed the UNESCO resolution, but not resolution 2334. Of course, because the U.S. did not vote “Yes” on this resolution, the administration can claim that it didn’t fully support it, including the “Palestinian territory” statement. In practical terms, this is sophistry because the U.S. abstention was essential for the resolution to pass. In justifying the U.S. abstention, Samantha Power, stated that the U.S. would not have let the resolution pass if it undermined Israel’s security or imposed a solution. Unfortunately, and indeed astonishingly, the unwarranted depiction of East Jerusalem as Palestinian territory, though it contradicted long-standing U.S. policy, somehow did not constitute grounds for casting a veto. So there we have it: A U.S. government that has been at pains to avoid referring to any part of Jerusalem as Israeli territory, as vividly demonstrated by the correction of the eulogy text, made it possible through its abstention for the Security Council to refer to “East Jerusalem” as Palestinian territory. To say that the status of Jerusalem is a vital Israeli interest is an understatement. The U.S. under Obama’s stewardship has inflicted significant harm on Israel’s political position by these actions. 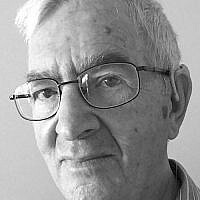 Lewis Rosen is a retired economist who has lived in Jerusalem for more than 30 years. Born and educated in the US, he worked for the Office of Economic Opportunity for two years in Washington D.C. and was on the economics faculty of York University in Toronto, Canada for 13 years. In Israel he has been involved in a wide range of business planning and economic analysis projects.